We are so excited for Spring and everything that comes with it, which means our favorite local farms will have some wholesome spring produce for us to use in the kitchen. Keep an eye out as Chef Tom and the Vinnie’s kitchen crew get the creative juices flowing, bringing some lively flavors to your plate. To start, enjoy our NC Clams Casino with Spinach, Bacon, Red Pepper, Parmesan and Panko. Last chance to try our Butternut Squash Bisque topped with Crispy Trumpet Mushrooms, Smoked Sour Cream and Scallions. Later this week, from our friends at Locals Seafood, we’ll have NC Rockfish. Call or come by to see how Chef Tom will be preparing this delicious fish. In the Tavern, try our NEW featured Burger made with Certified Angus Beef topped with Prosciutto, Swiss, Whole Grain Mustard Aioli, and Pickled Onions on a Pretzel Bun. 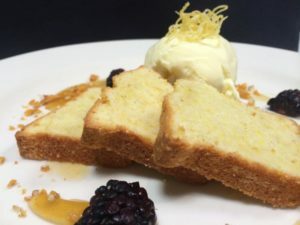 As a grand finale, enjoy our Southern Style Pound Cake served with homemade Lemon-Buttermilk Ice Cream, Earl Grey Syrup, Fresh Blackberries, Pecan Brittle and Candied Lemon Zest. Last but not least, there’s one more thing that we’d like to ask for your help with. Some of our favorite local publications have begun voting for this year’s “Best Of” lists and we’d like you to help us show everyone how great Vinnie’s really is. We have provided links to Wake Living Magazine and Indy Week for your convenience so you can do your part. We greatly appreciate your vote for any category you think would suit us. 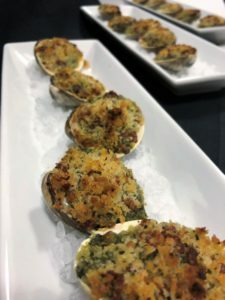 NC Clams Casino is packed full of flavor, including Spinach, Bacon, Red Pepper, Panko Crumbs, and Parmesan. Perfect to share or you can enjoy them all, we won’t judge. Southern-Style Pound Cake served with Homemade Lemon-Buttermilk Ice Cream, Earl Grey Syrup, Pecan Brittle, Blackberries and Candied Lemon Zest. Yum!